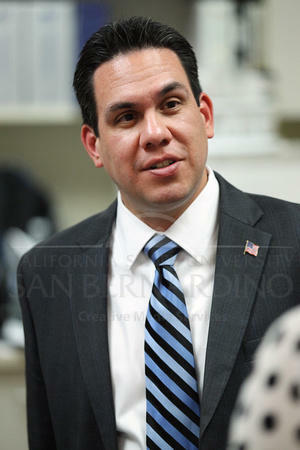 Inland Empire Member of Congress Pete Aguilar (D-Redlands) is one of 17 lawmakers from both parties on the congressional committee negotiating with the Trump Administration on border security, including Trump's demand for money to build a wall along the U.S./Mexico border. In this interview with NPR's Steve Inskeep on "Morning Edition" this morning (Thursday), Aguilar held firm against wall funding, and instead suggests investments in more manpower or broader use of technology to curb illegal immigration. The Aguilar interview is followed by analysis from NPR Political Editor Domenico Montenaro. Representative Pete Aguilar has been chosen for a leadership role on the House Appropriations Committee. KVCR’s Benjamin Purper has more. Aguilar, whose district includes San Bernardino and parts of Rancho Cucamonga, was chosen as Vice Chair of the House Appropriations Committee. The representative also announced he will serve on the Appropriations Subcommittes on Defense; Transportation, Housing & Urban Development; and Homeland Security. Now in his third term, Aguilar also holds the leadership position of Chief Deputy Whip of the House Democratic Caucus. The San Bernardino County Board of Supervisors this week held a public forum on cooperation between the San Bernardino County Sheriff's Department and federal Immigration and Customs Enforcement agents. KVCR's Benjamin Purper has more. Two-term Inland Empire incumbent Congressman Pete Aguilar is in a close race with challenger Sean Flynn, who boasts he is a moderate Republican and says he would vote to impeach President Trump. But is Aguilar's 31st Congressional District seat really in trouble? KVCR's Benjamin Purper spoke to both candidates, and has this report. In the June primary, Republican Sean Flynn came within a thousand votes of incumbent Democrat Pete Aguilar. Aguilar is a well-liked, two-term incumbent – so why was it so close? Democratic leaders in the U.S. House have chosen an Inland Empire congressman to join the House Democratic Leadership team. KVCR's Ken Vincent has more.